How many gondolas float down the canal? Can you count the number of masks at Carnival? Toddlers will answer these questions and more in this new book from Misti Kenison in her Tiny Traveler series. Travel from Rome to Venice as you and your little one count your way through Italy’s most famous landmarks. From one leaning tower to seven fresh pizzas coming out of the oven, you’ll catch the travel bug while teaching children the basics of counting! 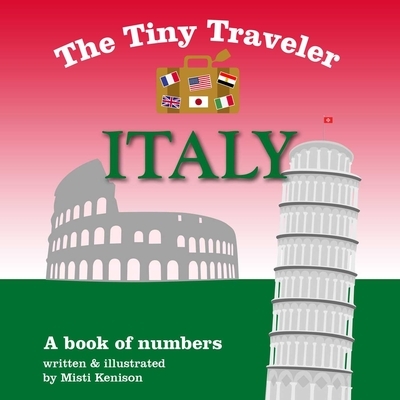 The fourth book in Kenison’s Tiny Traveler board book series will exposure your child to another country and culture while teaching him or her the basic concept of counting and numbers. So sit back and explore the world with your little one from your very own living room. Traveling to foreign places has never been so fun, or educational, for young children before! A wonderful series for young toddlers (0 to 2 years), this book teaches the basic concept of numbers and counting. Can be used at home or in a childcare facility to teach basic concepts. Misti Kenison is a web/graphic designer and owner of MK Design. As a new mom, she believes strongly in encouraging literacy at a very young age, and hopes that this series will be a great tool for other parents to do so as well. She is the author of the Tiny Traveler series. She lives in Little Rock, Arkansas.